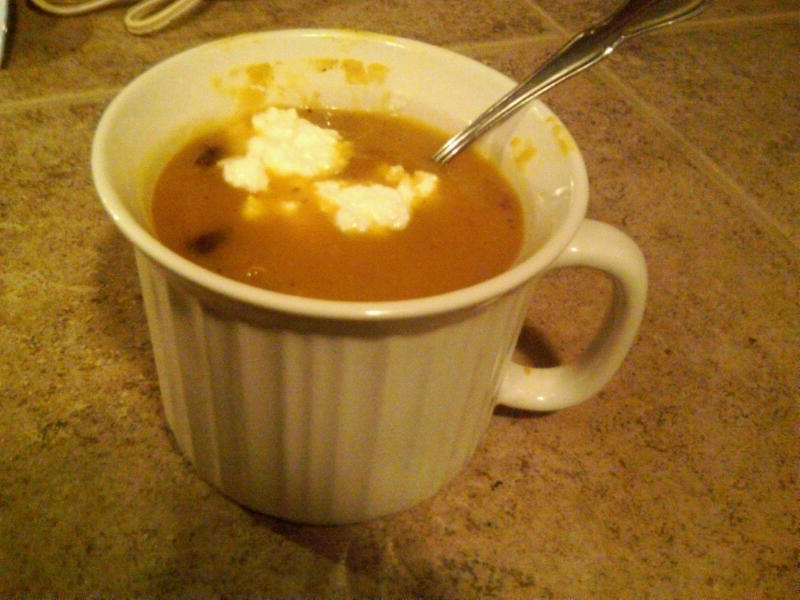 This was not only my first time making squash soup, but my first time eating it too! For whatever reason I had never tried it before. I thought this soup was really good. The texture was very soothing and the mixture of squash apple and onion came out just right (in my opinion about my own soup!). Heat oven to 375 degrees. Cook squash for 30 – 40 minutes until soft. When squash is cool enough scoop out flesh into a blender or food processor. While squash is cooking melt butter in a soup pot over medium heat. Peel and chop the onion and apple. Add onion to butter. Cook onion for about three minutes until translucent but not browned. Add chopped apple to the onion and cook for another three minutes until the apples is just soft. Add the onion and apple mixture to the squash in the blender or food processor. Add just enough broth the cover everything. Puree the mixture. Add the puree back to the soup pot with the rest of the broth and spice. Simmer until hot and ready to serve. If desired add crumbles bacon and a dollop of yogurt to garnish. What can be used instead of onions? And what can be used instead of broth?